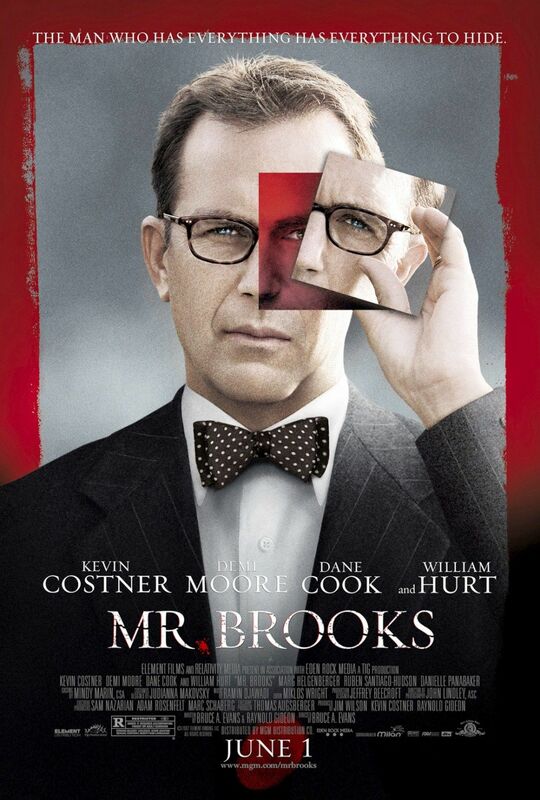 Mr. Brooks – The man who has everything has everything to hide. Directed by Bruce A. Evans. Screenplay by Bruce A. Evans and Raynold Gideon. Mr. Brooks (Costner) just received Portland’s “Man of the Year” award and he is probably the least deserving of that award, because Mr. Brooks is addicted to killing people. We watch in fascination as Mr. Brooks and his imaginary friend Marshall (Hurt) debate on whether or not to go kill a couple he has been watching. He convinces himself to kill the couple. We see the rush that he feels run through his body as he shoots the couple. It is after this moment he sees the curtains are open. He closes the curtains but it is too late. A few days later he is visited by Mr. Smith (Cook) who has photos of Mr. Brooks in the window during the murders. He blackmails Mr. Brooks into taking him along on his next killing and Mr. Brooks lets him choose the target. Meanwhile, Jane Brooks (Panabaker) has quit college and come home. She is hiding something from her parents and Mr. Brooks is going to protect her from whatever it maybe. Detective Tracy Atwood (Moore) is going through a bitter divorce where her dead beat husband is looking to take a sizable amount of her fortune (her family left her money and she became a cop). She is actively looking for the “Thumbprint Killer” but her prey is every bit as cunning as she is. She works diligently in the hopes of crossing paths with the “Thumbprint Killer” but she might get more than she expected. The performances by William Hurt, Demi Moore, Dane Cook, Daniella Panabaker and Ruben Santiago-Hudson are all very good. Kevin Costner earns every penny of his salary as the lead actor because his performance is brilliant. This movie is dark with a seriously disturbing subject manner but director Bruce A. Evans takes us on the ride with a serial killer and keeps us on the edge of our seat from beginning to end. If you liked this try: Silence of the Lambs, Red Dragon, Zodiac.